FLINT RIVER GOLD IS MY ONLY 2009 INTRODUCTION. IT IS A 38 INCH TALL 6.5 INCH TETRAPLOID WHICH BLOOMS WELL ABOVE THE FOLIAGE AND IS MORE OF A GREENISH YELLOW GOLD THAN IT'S PARENT MARY'S GOLD. CAN BE USED TO BREED FOR FULL OR UNUSUAL FORMS AND I AM EXPERIMENTING WITH USING IT FOR GREEN. THIS CULTIVAR HAS GROWN ON MY CLAY HILLSIDE FOR SEVERAL YEARS AND HAS BLOOMED THROUGH DROUGHT WHEN FEW OTHERS HAVE BLOOMED WELL. IT HAS SHOWN NO RUST SO FAR AND FOLIAGE REMAINS GREEN DURING DRY WEATHER WHEN ALL ADJACENT CULTIVARS ARE EATEN UP WITH SPIDER MITES. WITH GOOD CULTURE IT HAS AT LEAST 5 WAY BRANCHING AND 25 OR MORE BUDS. SCAPES ARE THINNER THAN MARY'S GOLD BUT HOLD UP BETTER AFTER RAINS. 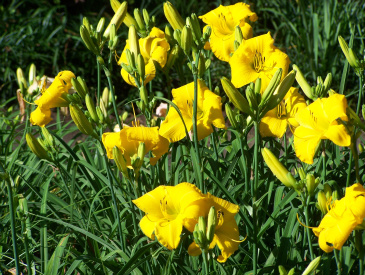 A THREE FOOT SQUARE SECTION THIS YEAR HAS MANY FANS AND 300-400 TOTAL BUDS, JUST A LANDSCAPING DELIGHT SURPASSING "DITCH LILIES". POLLEN FERTILE, POD DIFFICULT. DORMANT. I work for Oakes Daylilies of Tenn., a good sized commercial daylily operation. We sell a good bit of Mary's Gold, but I like the color of Flint River Gold! this is a great daylily for the landscape! I love Flint River Gold. Really stands out! We need more daylilies like this one in commerce.